Discussion in 'Betta Fish' started by smaurer3076, Apr 17, 2017. I have a koi female betta that I've had for going on 2 weeks and she's starting to turn more orange than red. 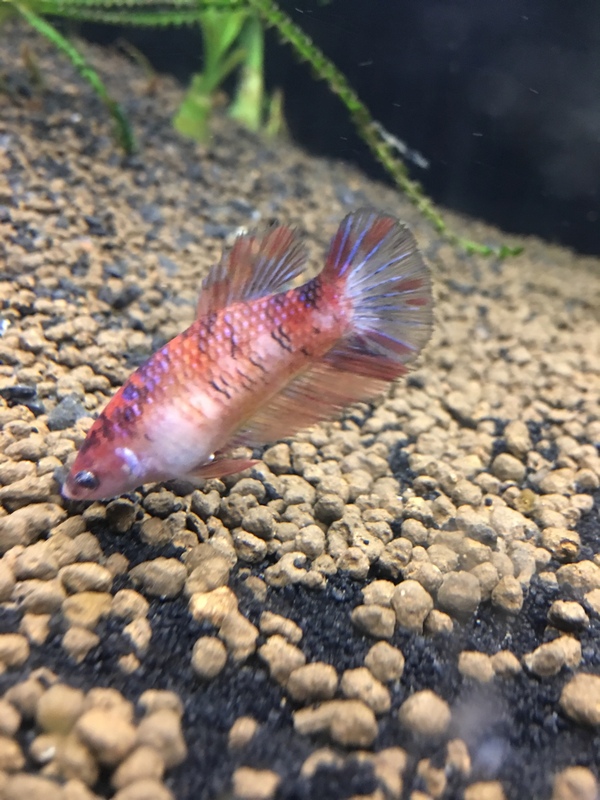 I'm wondering if she's just changing colors like I've heard koi bettas do or if something is wrong. Excuse the poor picture quality but she's very hard to take pictures of lol. Not just kois , all bettas can change color! When they are young their color can get darker or lighter, sometimes even add or remove color! I'm worried though because I have seen her scratch against the driftwood and plants a couple times and I'm wondering if it's because I have high iron in my water? I'm hoping in her case that she turns blue and black with a little bit of red! What are your parameters? Is the tank cycled? And my tank had cycled for a month with stability and then slowly added fish throughout 3 months after.